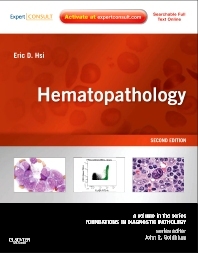 Hematopathology, a volume in the Foundations in Diagnostic Pathology Series, packs all of today's essential know-how into a concise, high-yield format! This medical reference book’s well-organized approach, full-color illustrations, and at-a-glance tables make the information you need easy to find, so you can diagnose the most commonly encountered hematologic conditions as efficiently and accurately as possible. Efficiently diagnose the most commonly encountered neoplastic and non-neoplastic conditions of the hematologic system. Review normal histology before examining abnormal findings. Reference information quickly with a user-friendly format that explores each entity’s clinical features, pathologic features, ancillary studies, differential diagnosis, and prognostic and therapeutic considerations. View key features of a wide variety of pathologies with hundreds of full-color illustrations.